Currently “Nancy Erickson: We Have Always Lived Together” exhibit at the Holter Museum of Art in Helena, Montana, is on through April 4, 2010. Nancy’s quilted textile pieces speak to the connection we all have with one another and the land – and what’s left of the wilderness. The animals are the seers. Lots to see at the Anderson Art Center! Photos are the Anderson Art Center’s. The largest quilt show in the world, Tokyo's International Great Quilt Show, is held annually in Japan. This year more than 220,000 people attended the show, which was last month. Click here to see a Smilebox slideshow of quilts from the 2010 show, which is on The Quilt Show's Daily Blog. Jennifer at http://movinghands.wordpress.com/ shared her photos of the competition with The Quilt Show. The Indiana Heritage Quilt Show is set for March 4 – 6, 2010, at the Bloomington Convention Center in Bloomington, Indiana. The web site is: www.ihqs.org for more info about the show. 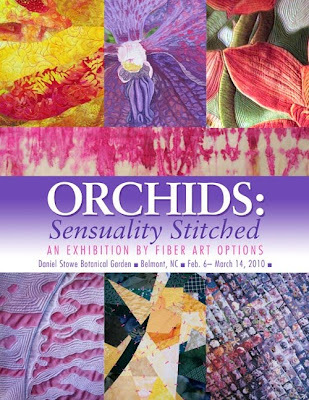 The “Orchids: Sensuality Stitched” exhibit will be shown Feb. 6 through March 14, 2010, at the Daniel Stowe Botanical Garden in Belmont, North Carolina. This is an exhibition of orchid-inspired work by Fiber Art Options, seven women artists from the Charlotte area who work in fabric, paper and thread. The seventh International Fiber Biennial opens on February 5, 2010, and is on until March 20th. The exhibit is at the Snyderman Works Galleries in Philadelphia, Pennsylvania. Sites are: www.snyderman-works.com and http://www.snyderman -works.com/gallery.html/ for more information. My piece that I began last summer was posted on my blog on October 6, as you can see above. This quilt by Sharon Schlozhauer, which was exhibited in the 2010 Road to California Show, and mine are similar, the five flowers being mariners’ compasses. You are currently viewing the archives for February, 2010 at Woodhaven Studio's Weblog.